The 1978 Drum Corps International World Championships returned to Colorado for the second year in a row. As was done for the previous year, the Prelims competition was held at Folsom Stadium of the University of Colorado in Boulder, while Finals was held at Denver’s Mile High Stadium. Santa Clara Vanguard, who had finished as low as fifth place earlier in the season, won the title by just a tenth of a point over Phantom Regiment and more than three tenths of a point over the Blue Devils, the latter corps coming off two straight Championship titles. The third-year drum corps North Star and second-year drum corps Spirit of Atlanta earned a spot in the Finals competition for the very first time. It was the last year that the Kilties made the Finals, after turning coed earlier in the year, following 43 years as an all-male corps. 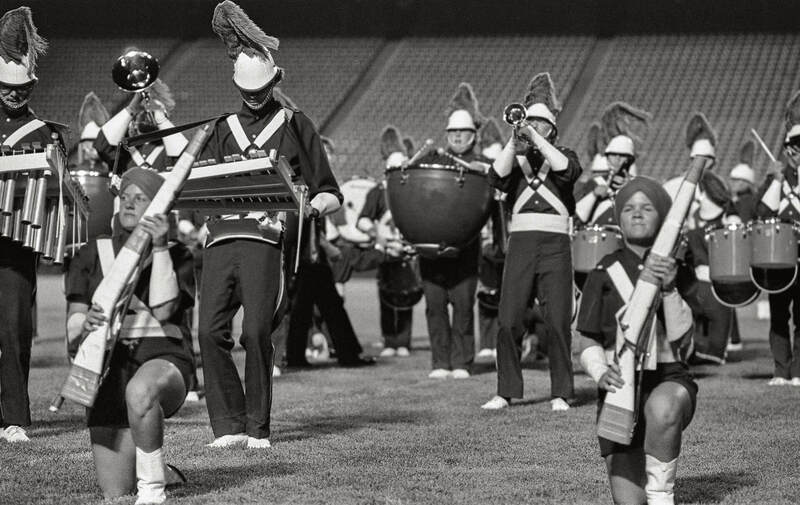 Three finalist corps in 1977 didn’t advance into the Saturday show in 1978, including the Cavaliers, Garfield Cadets and Freelancers. Finishing in eighth place, more than half of the Blue Stars’ 1978 production was comprised of pieces played by the La Crosse, Wisconsin corps in previous years. Corps members took the field in their traditional navy blue uniforms with white cross straps and silver buckle. Brass players wore pith helmets with off-centered red plumes, while color guard members wore turbans in the same bright color. A percussion feature came next comprised of “Suite for Flute and Jazz Piano,” which was extracted from two movements of Claude Bolling’s 1973 work, the 5/4 time signature “Javanaise” (mvt. 3) and “Véloce,” (mvt. 7). Bolling, a French jazz pianist and composer, has written music for more than 100 films. The suite was written with jazz flautist Jean-Pierre Rampal in mind and sat on the Billboard top-40 jazz category for more than 10 years. Even though the work didn’t win the category, it was nominated for a 1975 Grammy Award for Best Chamber Music Performance, a rarity for a jazz composition. 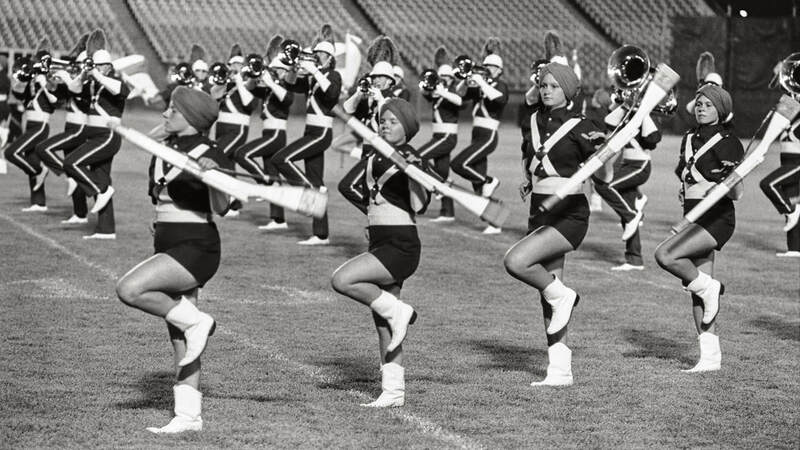 The feature was performed by just two mallet players, as the corps in 1978 elected to not increase the number of mallet players. “Shema” sequed into “Hatikvah” (“The Hope”), which, though long considered the unofficial anthem of the State of Israel, didn’t became the official national anthem until 2004. The melody was penned by a Jewish poet in 1878 in what is now part of Ukraine, inspired by a 17th Century Italian song that was popularized throughout Europe. At the company front push, the horns advanced slowly while stooping on alternate legs and then bringing the other foot forward so both heels would meet before the members once again moved forward. The final work to return from 1977 was the standstill of John LaBarbera’s “Backwoods Sideman,” from the 1973 Buddy Rich big band recording, “The Roar of ’74.” (This is the same album that also gave drum corps “Nutville” and “Waltz of the Mushroom Hunters.”) Towards the end, the rifles picked up either red and white or blue and white striped umbrellas, opening and closing them to the musical swells, an effect first popularized in the corps’ 1977 show. The drum major ended the work wearing an umbrella hat. The closer of “Come in From the Rain” was co-written in 1975 by Melissa Manchester and Carole Bayer Sager for Manchester’s fourth album, “Better Days & Happy Endings.” It has since been become a recording standard by a large number of other artists. Towards the beginning, the corps formed their trademark five-pointed star form for a few seconds. A brief tag to the closer was offered by John LaBarbera’s “Tiger of San Pedro,” following up on three years of tags based on Bob James’ “Soulero.” Jazz trombonist Bill Watrous and his Manhattan Wildlife Refuge big band recorded the piece as the title track on their “Tiger of San Pedro” album of 1975. The title refers to one of the 56 stories written by British author Arthur Conan Doyle in his series of short stories, “The Adventures of Sherlock Holmes.” Three diamond-shaped blocks of horns closed in on each other to form a large block triangle before spreading out across much of the field for the final blaring chords. 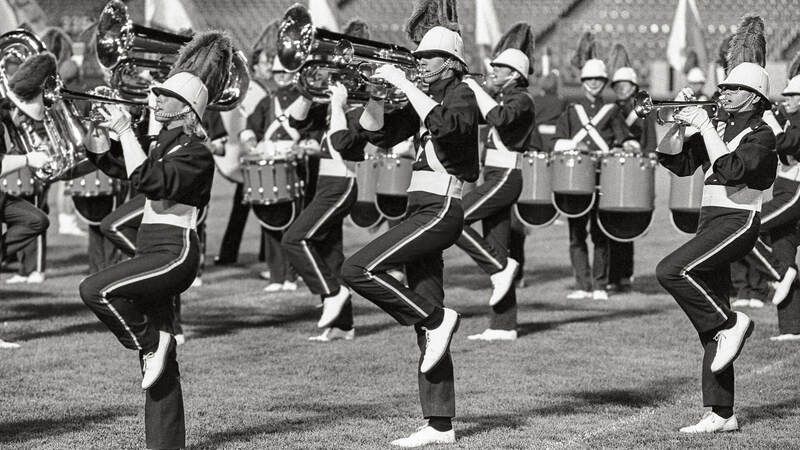 The following year was the corps’ last in Finals for quite some time, slipping to 10th before falling to 13th in 1980 and then plunging to 37th in 1982. Starting in 1986, the corps competed in Class A/A 60 (the predecessor to Division II/III and eventually Open Class), and then reentered World Class competition in 2006. In 2008, the corps made World Class Finals for the first time in 29 years and then placed 8th three years in a row.